Put Darigold butter in an ovenproof dish and place in preheated oven 1-2 minutes until butter is melted. Stir in fresh salsa, cilantro, garlic, lemon juice, salt and pepper and shrimp. Bake for 20-25 minutes. 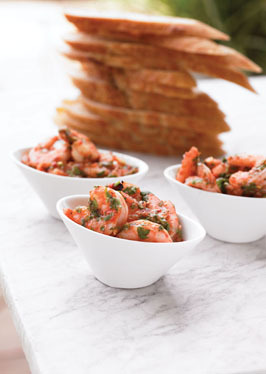 Remove shrimp from baking dish with slotted spoon and arrange on a serving plate with baguette slices. Pour sauce from baking dish into a serving bowl. Makes 15 to 20 appetizers.